JBQ lanyards are great for name tags but, even better, they’re a fun and colorful way for kids to display their award pins and show their quizzer pride and accomplishments. Print your own name badges using an Avery Name Badge template (Note: try Avery Name Badge 5392 or 5390). 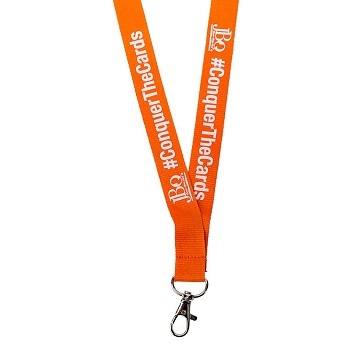 Featuring the JBQ logo and the #ConquerTheCards hashtag printed in white. Lobster claw clasp.